The NRL Solrad 8 (or Explorer 30, SE A) satellite was one of the Solrad series that began in 1960 to provide continuous coverage of solar radiation with a set of standard photometers. 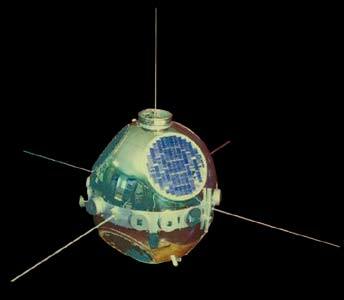 Solrad 8 was a spin-stabilized satellite oriented with its spin axis perpendicular to the sun-satellite line so that the 14 solar X-ray and ultraviolet photometers pointing radially outward from its equatorial belt viewed the sun with each revolution. Data were transmitted in real time by means of an FM/AM telemetry system and were recorded by the stations on the STADAN tracking network. The satellite performed normally except for the spin system, which failed to maintain 60 rpm (at spin rates below 10 rpm data reduction became difficult). The spin rate gradually decreased to 4 rpm on 12 September 1966. At that time, ground command succeeded in reactivating spinup to 78 rpm, which exhausted the gas supply. From this point, the spin rate gradually decreased to 10 rpm in August 1967, when data collection was substantially decreased.